Tactical pens have recently hit the market, especially since more and more urban areas are making it pretty much impossible to carry a weapon for self-defense. There’s a lot to be recommended when it comes to these devices, but there’s no real standardized definition. A good one should function as a decent improvised stabbing weapon, but from there they’ve naturally exploded until there are even knock-offs which end up basically being a multi-tool in pen form. There’s a lot to consider if you’re looking to snap up the best tactical pen, however, and we’ll showcase ten of the best and make sure to highlight their key features for you before we get into the usage of these handy devices. The Cold Steel Pocket Shark is a large, permanent marker made of a thick, impact-resistant polymer. 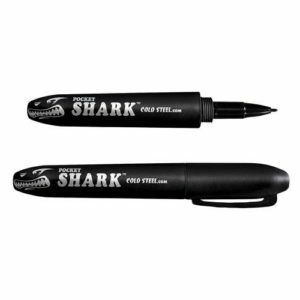 Who Is It Best For: The Pocket Shark is primarily useful for those who need a rugged permanent marker that’s quite durable, it’s usage as a weapon is quite limited for those without any training. Smith & Wesson makes some of the best tactical pens on the market, and this one is no exception. 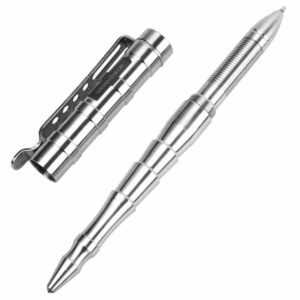 This is a large, sturdy aluminum pen with good areas for making forceful contact on both sides. Who Is It Best For: This pen is somewhat lightweight and requires a decent amount of force to achieve any penetration, making it ideal for those who already have a heavy hit but not really suitable for those with a weak grip and light hit. The Schrade SCPENBK is a fairly non-aggressive looking tactical pen constructed with high-quality materials. While it’s really only suitable for hitting on one end, it has a good amount of heft and a nice point to make it a good tool for impact. Who Is It Best For Due to the extra weight and non-aggressive look, this one is best suited for those looking for a discrete force multiplier. Unfortunately, you’ll need good grip strength to keep it on hand during a realistic impact. The Gerber Impromptu is truly a “tactical” pen, insomuch as it’s a pen designed to be used in adverse conditions which can function as a last-ditch weapon. It’s slim and fairly discrete, with a good little pointy bit making up for the lack of the usual structure found in these kinds of pens. Who Is It Best For: The Gerber Impromptu is best for those who need a pen first and a last-ditch weapon second. The positioning of the glass breaker lends it well to penetration for those who don’t have as much strength, however, and it’s not much bigger than a regular pen. 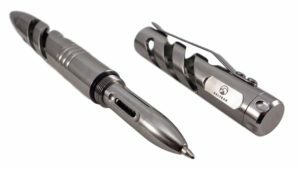 Crafted entirely of titanium, this was one of the most sturdy of the multi-tool style tactical pens we took a look at. It’s a bit high in cost, but it has a lot more uses than just poking someone. Who Is It Best For: This tactical pen is best used by those who have a heavy hit in the first place since the skeletonized design reduces the weight, but most people should be able to maintain a good grip on it in the event of an impact. 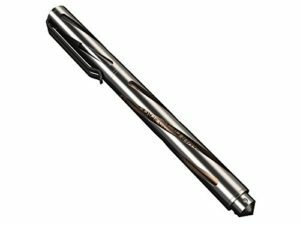 With a stylish exterior and a tungsten steel window breaker, this pen looks rather benign but packs a serious punch when it’s required. It’s also a bit smaller than many of the other options we looked at. Who Is It Best For: This smaller, benign-looking pen is great for those who want to be able to pack a heavy punch but still fit in at the office. The smaller size is a double-edged sword, however, since it can be hard to grip securely for those with heavy hands. 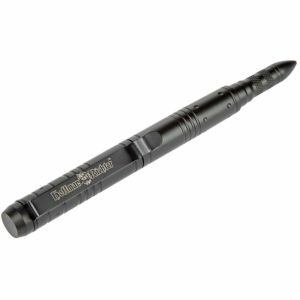 While not quite as sturdy as many of our top choices, this tactical pen has a ton of extra features to make it a great survival tool. If you’re looking for a cheap EDC pen then you should take a closer look at this one. 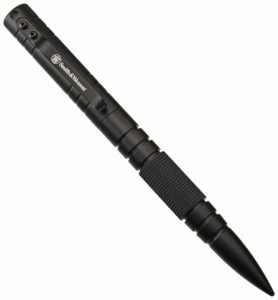 Who Is It Best For: The steel construction and added weight makes this an ideal self-defense pen for those without a lot of hitting power in the first place, and the extra EDC features make it great for everyone else as long as you aren’t trying to carry it on a plane or into a courthouse. 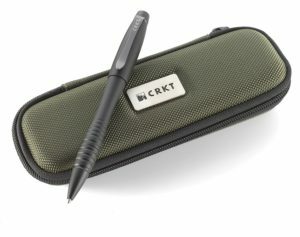 CRKT makes some of the best knives on the planet, and their quality extends to their tactical pens. The Williams Tactical Pen is the most subtle of the tactical pens we took a look at, and it’s definitely got enough punch to put an opponent down. Who Is It Best For: If you’re looking for a pen which isn’t going to be confiscated, no matter where you go, then the Williams Tactical Pen makes a great companion. 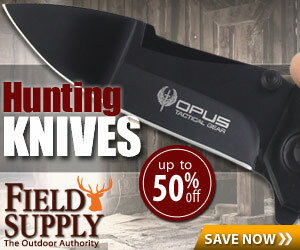 Those looking for more of a survival tool may want to go with something else, however. While the “titanium coating” is pretty much all marketing, this is a fairly subtle pen with a heavy-duty tapered tip for striking. It was also the most balanced of the pens we use, for what it’s worth. Who Is It Best For: This tactical pen is well balanced, and a good option for those who don’t have any formal training with using a tactical pen or kubotan, it’s a bit lacking on the utility side of things, however. The heaviest of the tactical pens we checked out, the Sahara Sailor packs a might hit. It’s also pretty obviously designed to be a weapon in a tight space, so make of that what you will. Who Is It Best For: If you have a slight build and not much hitting power in the first place, you’ll be in good hands if you’re forced to use this as a force multiplier, the sharp tip and steel build add together to make this the heaviest hitter of our favorites. Many manufacturers are quick to point out that their pens make a great weapon. Whether or not that ends up being true is going to largely depend on you, rather than the pen itself. While self-defense techniques utilizing pens have been around for some time, they really shouldn’t be your first choice in a weapon. The truth is… if it’s short and pointy then chances are you’re going to be able to use it to defend yourself if you have a bit of weapons training. The marketing which surrounds tactical pens is pretty bold. Frankly, in many cases what they recommend is beyond the training of the average person and more likely to get you hurt than to allow you to disable an attacker. In a live-fighting situation, a tactical pen can make a huge difference. At least over being empty-handed. The problem with most of the proposed solutions comes from both demonstrations and the marketing of the pen. Demonstrations often show some of the higher end pens being pounded through wood blocks or ice. Of course, they use a hammer to do this, and chances are that if you can hit with your fist and provide as much force as a hammer… you really don’t need a tactical pen to ruin someone’s day at close range. Instead, the amount of force which you can supply is going to come from your own striking power and your grip strength. If you don’t have particularly strong forearms, you’re going to find that the pen will slide back in your hand. Even the best knurling isn’t going to keep it in one spot once blood gets involved. The other problem is that they’re often marketed as being useful for controlling “pressure points” and marketed as a superior self-defense tool. This appeals to those not familiar with the use of force in self-defense situations because the actual usage of a tactical pen is going to be brief and extremely violent. Here’s the real truth about using a tactical pen: the only way you’re going to get use out of one of these without extensive training, including live sparring, is as a shiv. The pointy end goes in the assailant, as hard as possible. Since there’s no real grip, chances are it’s going to get stuck after the first strike, although those with particularly good grip might get a second and third strike before it gets completely stuck. Your best bet, with even the best tactical pen, is going to be to keep it hidden until striking and strike with an overhand ice pick grip to the side of the head and neck. In this role, it can let you get away quickly. If hidden until striking, they can also be useful in a grappling situation in order to make an escape. As a survival tool, a tactical pen can be extremely useful. Don’t expect even the best of them to be able to be used as an actual weapon, however. There is another problem inherent to the usage of tactical pens: they’re almost always marketed as self-defense tools. This means that carrying one could be considered an offense in some areas, especially if it’s concealed, and that using one can place you in the same hot water you’d be in if you’d just carried something more effective. This is something that comes to mind a lot with self-defense weapons, as even the line where a pocket knife becomes a purposefully carried weapon gets a little bit iffy. Just be aware that if you do use a tactical pen to harm an attacker, then you’ll most likely be facing the same legal ramifications as if you had used any other weapon. They do have the advantage of often being able to be carried into areas where more obvious weapons aren’t allowed. There is a way to get around this: there are several sturdy pens with a good taper to them, made of stainless steel or aircraft grade aluminum which aren’t marketed as tactical pens. One of these could be seen as an improvised weapon, but in a self-defense situation could give you a legal edge since it just happened to be at hand and used, rather than being purposefully carried as a weapon. Combat Ready Pens-These are bulky. For our requirements, they had to function at least decently as a pen and have a strong body and point in order to be usable as a last-ditch weapon. Oddly enough, these tended to be the most expensive of the tactical pens we looked at. 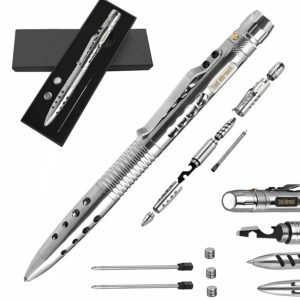 Tactical Multi-tool Pens-In these instances the pen functions well, the body is made of a suitable material to make it a stabbing weapon, and there is at least one other tool included to make it stand out. Subtle Tactical Pens-We only included a couple of these, because honestly nearly any high-end, metal bodied fountain or ballpoint pen will be able to make a mess of someone. We picked them for an inconspicuous look and exceptional materials in the body. To function properly as a weapon, a pen must have a solid body. Testing shows something a bit funny, however: lighter pens may be easier to carry but a heavier pen is going to pack much more of a wallop. Who each material is suited for is actually a bit intuitive: those with a weaker grip and strike will want a heavier pen. The weight of the pen can make up for the softer hit, while those with a strong grip and impressive striking power in the first place may find that a light pen is easier to carry and still packs a good hit. The pen pretty much has to be made out of metal. There aren’t any plastics commonly available which will hold up for more than a hit or two. The biggest choice is between aluminum and stainless steel. There are also titanium tactical pens out there, but the jump in cost isn’t usually worth the extra hardness. A tactical pen can only be made so sharp before it becomes a pain to carry, and as we described above you’re unlikely to need it to last for a hit or two. It does have a valuable use in a multi-tool pen configuration, however: titanium’s extra hardness makes it a good window buster. Basically, look for aluminum or stainless steel, unless you’re willing to pay a large cost increase for a small increase in utility. Lights-Bright LEDs are useful as flashlights and have some serious dazzling potential if you spotlight an assailant’s face in the dark. Window Buster-Being able to quickly break windows without risking your hand is one of our favorite features, the uses are pretty extensive. Multitools-There are a few different configurations of multitools which can be attached to these pens, the best are quite useful but even the worst are still better than nothing. Some of these pens also boast some pretty outrageous “enhancements” that we didn’t find useful. Most of them are unnecessary to detail, but a definite highlight(for humorous reasons)was the “DNA catcher”, which was basically a modified cutting end that’s probably going to keep some scraps of blood and skin if you have to use the pen defensively. Of course, chances are that if you did things right the pen is still stuck in the assailant, so good luck with that. As long as it writes you’re good to go. Here’s the big thing: don’t purchase a tactical pen which doesn’t actually work as a pen. It’s an easy way to catch a concealed weapon charge in many places. Some are better than others in this area, but most of the ones we looked at are at least functional. You shouldn’t expect a Cross or anything, but most of them were better than a standard Bic plastic pen. Finding the best tactical pen can be something of a chore, and even the best don’t really live up to the manufacturer’s claims but they’re definitely better than nothing. We favor those with multiple tools, finding them handier in day-to-day situations while still serviceable as a last-resort weapon but ultimately the choice is up to you.